Your hallway is like the legs of a supermodel; usually quite long and narrow. But what your hallway has over the pins of Giselle or Gigi is that you can make yours look amazing without photoshop! Get the hallway design tips below. When you think about hallway design, abandon the idea that this is something you have to lock in before your home is built. Hallway design can take place years after the property is erected, and you can revamp it really easily in just one weekend. The ideas I’m unveiling in today’s post aren’t major. They’re not installations, there’s no construction. You won’t see one ounce of tradie bum crack unless you ask your other half to get involved and insist they wear a low-rise pair of King Gee shorts. The concepts I’m showing you here are really cheap and easy, which makes the whole experience all the more enjoyable. 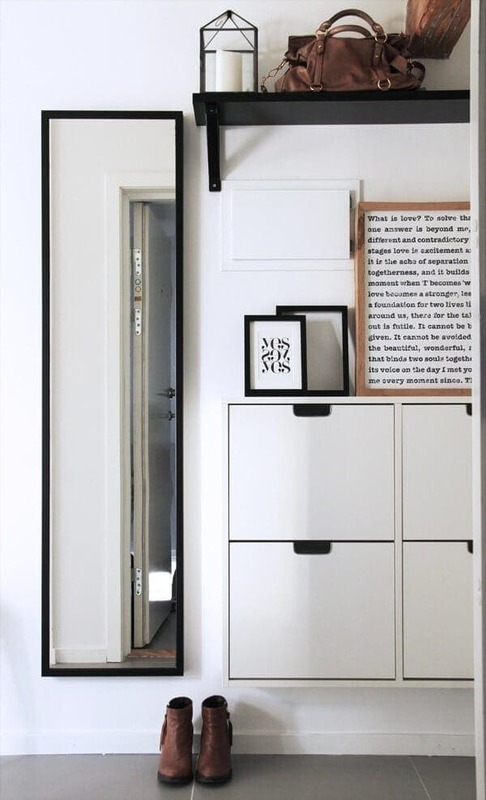 So let’s jump right into some hallway design makeover ideas and get this space sorted for you! There’s no easier way to give a usually sterile hallway a sense of warmth than by rolling out a rug or runner. Whether the hallway in question is right inside the front door or in another pocket of your home, the concept is the same. Putting down a rug or runner leads the eye down the hallway and allows you to create a focal point at the end of the journey. Style Steal: I love these runners from Zanui – absolute stunners! Picture Cred: IKEA is responsible for the stunning hallway design above. Hiding away your everyday items is so last year! 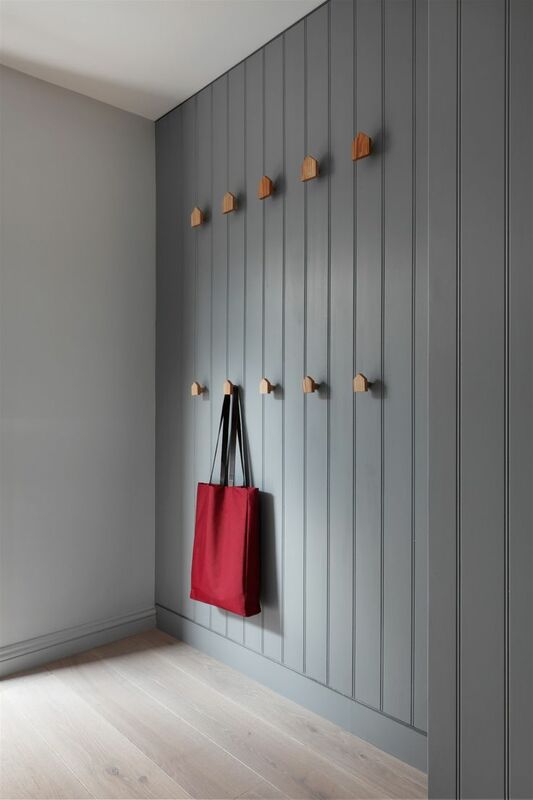 If you want to make your hallway design functional as well and fabulous, it’s all about stylish hooks and hangers. You can decide to place them all at the same level (or in a grid) for a formal approach. Or you can stagger them in random spots for a hallway that feels far more relaxed and casual. Style Steal: Zakkia is your go-to for chic hooks and knobs. Picture Cred: Pinterest is full of fab design moments like this one. White comes in many different shades, and so many of them are a snooze-fest, right!? Turning to colour is a phenomenal way to breathe new life into your hallway design and it’s so easy and affordable to do. I love the idea of a bright pop the moment you walk in the door. And if you’re fearful of doing all the walls, consider painting a feature wall or a section instead. Style Steal: Splash your walls with a bright colour like English Rose from Dulux. Picture Cred: Isn’t the pink wall above from Pilot Project kind of everything? This is by far the easiest one, and I reckon the one that people implement the most. If you want to take the concept of photos on the wall along your hallway to the next level, consider lighting. Placing lighting that points toward the art you’re showcasing makes it feel like your own private art gallery. And don’t feel like you have to make all the art symmetrical either. Spirit levels can be so time consuming, so ditch them and opt for a scattered look instead. This post will give you tonnes of gallery wall display ideas. Style Steal: Command Hooks are your friend when it comes to experimenting with hanging art. Picture Cred: Bonus points to My Domain for the rug in the photo above. A lamp on an entry table, or a floor lamp on it’s own; they’re both lovely ideas. But if you want to elevate your hallway design, consider an eye-catching pendant or chandelier. Dramatic lighting in your hallway is a killer idea, and gives you a reason to pause and look up when you walk through the hallway each day. 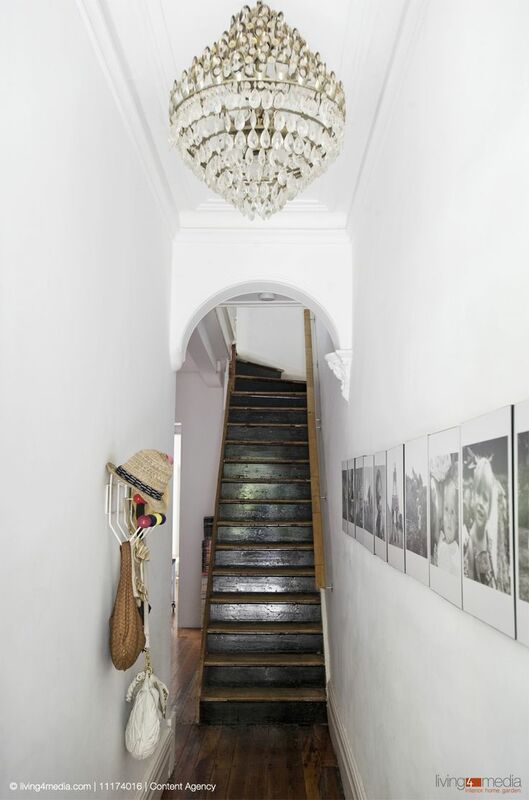 This concept will work well in a terrace home especially; the hallways often feature old pendants already. Style Steal: I love Schots Home Emporium for pendant lights with pizazz. Picture Cred: Living 4 Media knows how to rock lighting in a hallway. Now, I’ll openly admit that I am the world’s worst green thumb. So if you’re concerned about your hallway design featuring greenery, fear not! There are some amazing fake plants on the market (like these ones) you can use, and even some vertical gardens that feature artificial plants. If your hallway is wide enough, a fake vertical garden installation would absolutely SLAY. It will probably require a bit more cash, though, so perhaps just a lovely plant in a pot to begin with? Style Steal: Adairs does great fake plants at the moment and are well worth the look. Picture Cred: I love how Ecometry have rocked a plant moment above. OK, so if you read #2 and thought, I cannot bear to display my bibs and bobs for the world to see, then stellar storage is for you. There are a tonne of slimline shelves on the market – even ones designed to hold shoes – that you can mount to the wall yourself (if your drill skills are up to scratch). Add a mirror to your hallway design and you have a stylish space to do your final check in the morning before you leave the house. Style Steal: This storage system from Temple & Webster is one of my faves. Picture Cred: Elizabeth Heier is the style superstar behind this hallway design moment. OK, so this is the one exception to the ‘no tradies’ rule I told you at the start of the post. Unless you’re particularly handy (and I don’t consider myself a whiz with a hammer and nail), timber cladding will require a handyman to install. It’s going to be the priciest of the suggestions, but I thought it a necessary one to show you because it’s just stunning. Hallway design ideas don’t get better than this one, so give it a go if you want to make your hallway a tactile wonderland. Over to you on Hallway Design! OK, so I’m dying to know how you’ve made your hallway design shine at home. Have you tried any of the ideas above, or are there some others you’ve rocked? Don’t be modest; this is your time to brag about how amazing your hallway is. Drop me a comment below and share your hallway design ideas with me. The hero image in this post is a stunner and is from Old Brand New. Thank you for some great ideas! You are a gem!